A post mortem examination of a human head found in a quarry in Mepal on Monday (May 16) has come back inconclusive. Specialists are still unable to identify whether the head belongs to a man or a woman, however, based on the information available at this time, it is believed the person died before January 1, 2015. Detectives from the Beds, Cambs and Herts Major Crime Unit (MCU) continue to work with specialists in order to establish the gender and identity of the deceased. 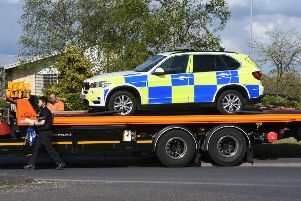 Officers were called at about 3pm on Monday afternoon (May 16) after a worker at the quarry in Block Fen Drove made the discovery. As part of the investigation, search officers have been carrying out activity at an aqueduct in Mill Road, Sharnbrook, Bedfordshire, as this is where the head is believed to have come from. A police spokesman added: “No other body parts have been recovered. Scenes still remain in place at both the Mepal and Sharnbrook sites.